Set your oven’s heat to 180 C and put some butter in your cake mold. Sift cacao, flour and salt into a bowl. Mix the egg and sugar for five minutes. Add the butter and continue mixing. Grate the chocolate and put the half of it into your mixture. Stir it once or twice and leave it. You can pour your dough into a big cake mold or you can use little muffin molds. After pouring, put the rest of the grated chocolate on the muffins. 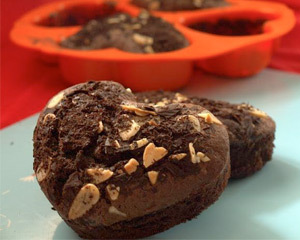 Finally, pour some crushed almonds and nuts on your muffins and place your mold(s) into the preheated oven. If you use a regular big cake mold, cook for 35-40 minutes; if you use little muffin molds, cook for 25-30 minutes.